It is our pleasure to unveil the Top 200 proposals. These are the 100&Change submissions that received the highest scores from our evaluation panel. Top 200 submissions are represented on an interactive map that shows where the proposed project takes place and demonstrates their collective global reach. We created one-line descriptions summarizing each project. You can sort by category or you can click on each pin to view videos about the proposals and visit the websites of organizations to learn more about their work. The Top 200 represent the top 25 percent of submissions that passed an initial administrative review and were evaluated by our panel of judges. As MacArthur’s Board of Directors selected the eight semi-finalists, it focused on these highest scoring proposals. Its review of proposals, however, was holistic. The Board considered the judges’ comments, as well as their numeric ratings. We are featuring these projects here in hope that this public recognition and exposure will lead to other funding opportunities. While 100&Change focused on four criteria – meaningful, verifiable, feasible, and durable – that accounted for the composite score, other funders or programs might be interested in different criteria. For funders interested in early stage research and testing, verifiable may not be as important as feasible. 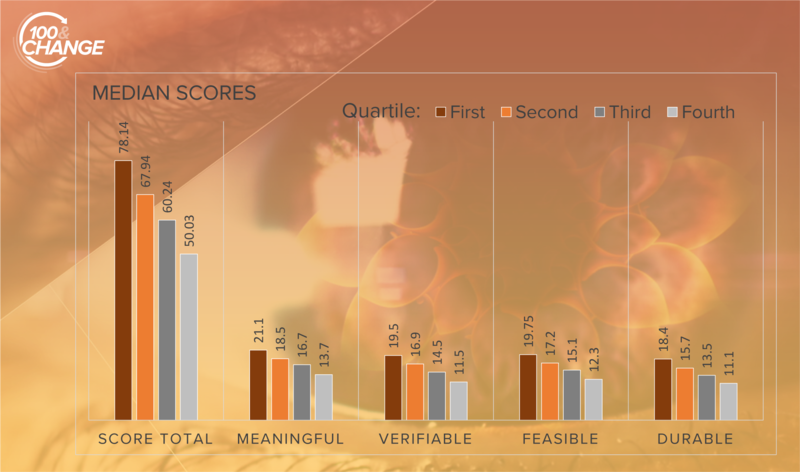 For funders interested in identifying more effective and efficient delivery of a social service, the scores on meaningful and verifiable might be more informative than a score on durable. We elected not to release individual rankings, because they distract from important information embedded in judges’ comments, which we shared with each applicant whose proposal was evaluated. A public, searchable database of all the proposals will also be posted online later this year. We do, however, understand the desire to have a point of comparison. To provide some perspective, the median composite score for the Top 200 was 78.14. By comparison, the median composite score for all the proposals reviewed was 63.74. The first is that $100 million can fix a problem forever. The Carter Center requires an investment in a volunteer-led, mass administration of the drug ivermectin to eliminate transmission of river blindness. Once the disease transmission vector is broken, there is a low probability of the disease reoccurring. The second is that $100 million may set up the infrastructure required so the ongoing marginal cost is low and there is an identifiable revenue stream to cover it. Himalayan Cataract proposes driving down the cost of delivery of vision care even as it expands availability, by increasing the supply of providers and realizing economies of scale. And the third is, $100 million may allow you to unlock resources and identify others who will commit to funding it over the longer haul. Catholic Relief Services’ proposal relies on this logic. It argues that the $100 million investment will divert the philanthropic dollars currently directed to institutional care of orphaned children to family-based alternatives. As we previously said, there may applicants who submitted proposals that addressed a significant problem, yet their scores reflected the parameters of the competition, not the quality of their idea. That is why, even as we acknowledge the accomplishment of the Top 200, we want to de-emphasize a focus on composite scores. Numbers and ratings are only one way to evaluate performance. Like our Board, we encourage applicants to place equal weight on the judge’s comments and take a holistic view.